Six Senses Duxton is situated in Tanjong Pagar, the island city-state’s central district and the eclectic heart of Chinatown where business, socializing, dining and nightlife take center stage. 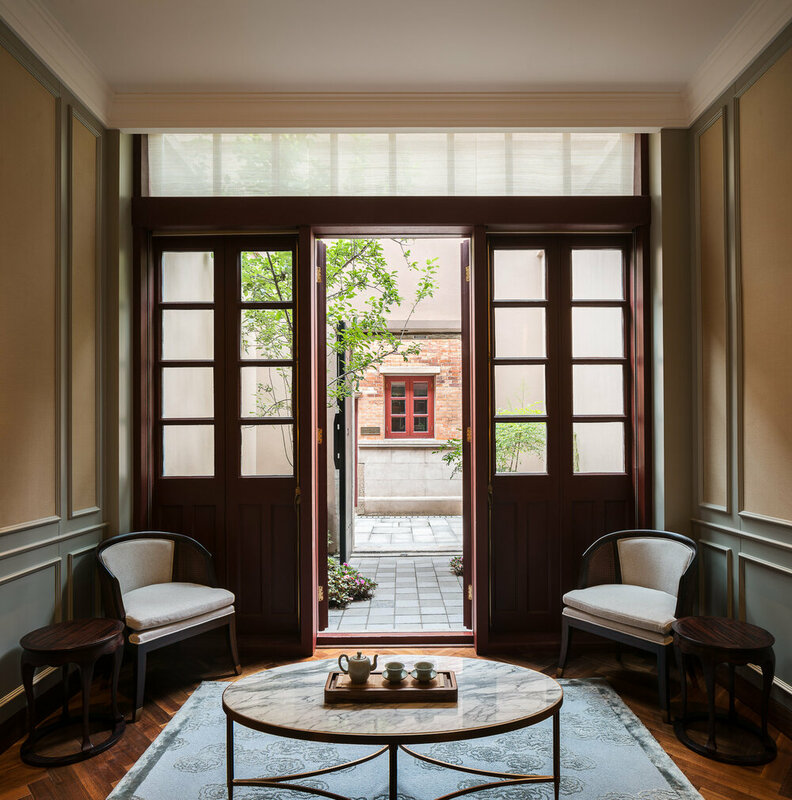 The boutique hotel in Singapore unites a row of heritage trading houses that have been sustainably restored under the gifted hand of acclaimed British designer, Anouska Hempel. The original design of this Urban Redevelopment Authority Architectural Heritage awarded building features a diverse mix of Chinese, Malay and European elements. Designed after the opulent yet notorious opium dens that used to occupy the shophouses in the area, Opium Rooms are a modern interpretation of these dens filled with opulence. With details perfected using intricate craftsmanship and beautiful lacquerware, the room features a four-poster bed and a walk-in shower. Pearl Room at Six Senses Duxton. Yellow Pot Restaurant at Six Senses Duxton. Originally built in the 1930s by French real estate company Foncière et Immobilière de Chine, the Jian Ye Li “shikumen” complex; located in the heart of the former French concession had evolved and been altered over the years but was essentially intact in its historical configuration and represented an incredible development opportunity. Originally these “shikumen” buildings were designed for middle class families in Shanghai and as they lacked modern plumbing facilities they were often seen as products with little value to preserve and were either demolished or just the “shell” was maintained and they were converted it into commercial use. After extensive research and study, Kokaistudios developed an architectural renovation strategy that maintained the architectural features of the “shikumen” lane houses while tastefully altering the internal layout and transforming them into spaces suitable for modern luxurious living where each original lane house unit was transformed into one luxurious guest suite. Practicality is not a term that applies to this project as the shikumen architectural typology; characterized by their narrow and tall nature meaning that the minimum 110 sq.m suites are split over 2 floors via a step staircase with no elevator; does not lend itself naturally to conversion to hospitality use. However when the ultra-luxury Capella hotel brand entered into the project several years later minimal upgrades to the architecture of the buildings were required to meet their exacting standards and they created 55 luxury suites each occupying one of the lane-houses. Today the hotel occupies a unique position within Shanghai’s luxury hotel landscape and offer their guests a truly unique hospitality experience not available anywhere else in the world. Cook & Tras Social Library at Six Senses Maxwell. The beautiful classic décor creates a warmly intimate atmosphere set in a fully curated social library, with richly textured custom-designed furnishings. Open throughout the day for light breakfasts and an all-day “small-plates for sharing” menu plus a fully bar service. 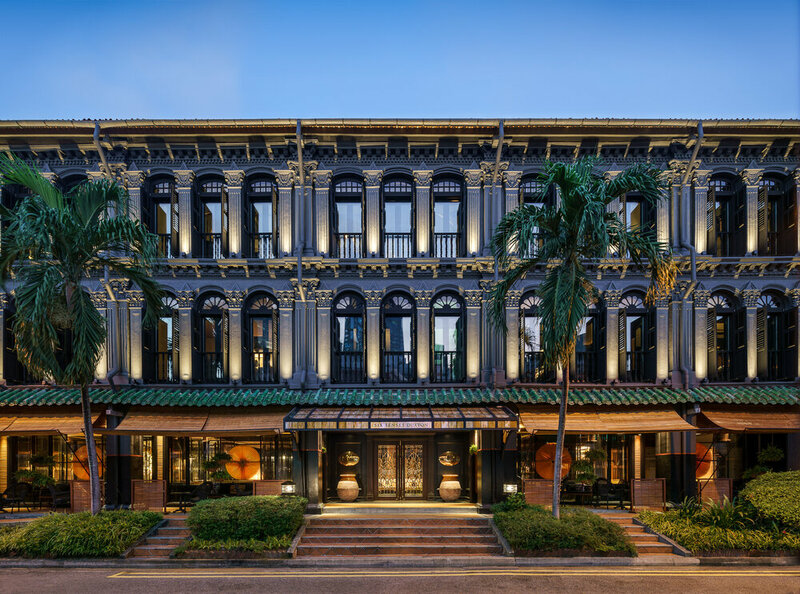 Six Senses Maxwell is set in a block of heritage shop houses in Singapore’s Chinatown and has been beautifully restored to its original grandeur with interiors by French designer Jacques Garcia. Each of the hotel’s 138 guestrooms and suites are carefully decorated with custom furnishings and original artwork. It offers an eclectic collection of concept restaurants and bars, complementing other in-house facilities such as an outdoor rooftop lap pool and well-equipped gym. Together with Six Senses Duxton, the two hotels become Six Senses Singapore and showcase the brand’s ongoing commitment to responsible restoration and conservation. Terrace Room at Six Senses Maxwell. A beautifully designed room with one king or twin double beds. The contemporary timber-floored rooms have a European-style multi-fixture bathroom with walk-in rain showers, a separate water closet and some rooms with a free-standing clawfoot bathtub. Kokaistudios' newest projects with Four Seasons Hotels & Resorts - the Dai Forni Italian located in the newly built Four Seasons Kuwait in the Burj Alshaya building. Having previously worked together on the Brasserie at the Four Seasons Kyoto the Four Seasons team invited Kokaistudios to conceive an elegant F&B destination bringing the freshness and tastes of Italy to Kuwait. The starting point of the design process was to canvas Italy and determine which part of its vast culinary heritage and geography to focus on and the designers quickly settled upon the tastes, smells and textures of the Mediterranean and in particular the island of Sicily; long the meeting point between the cultures of the Middle East and Europe. Dai Forni is part of the emerging global cultural culinary trend of regional rather than national cuisines; and the restaurant design and cuisine are a testament to this trend. Kokaistudios envisioned the space as an oasis for all of the senses with the entrance characterized by an immense green wall; itself an innovative structure filled with local desert plant varietals; and large fire pillars that frame the entrance experience and bring the guests along a sandstone floored corridor into main dining areas centered by an expansive antipasti counter covered in a pink hued hand treated cooper from Italy. To the left of the entrance corridor sits the front dining area featuring a stunning 12 meter high space with expansive views onto the city and the Persian Gulf beyond. The designers have enrobed the space in a custom designed metal mesh curtain illuminated by a diffused lighting system that creates a soft shimmering glow. The intense sunlight and temperatures during the day-time drove the creation of an elaborate system of laser cut curtains that help to maintain a cool and welcoming temperature. By working with world renowned craftsmen from Italy to Australia and points in between; employing subtle design instruments; and a focus on appealing to all the six senses we have a created a project that is simultaneously rooted in Middle Eastern culture while being a true embodiment of Mediterranean and Sicilian food culture. The design of this project is a new step in Kokaistudios method of combining a strong architectural approach to the design of interiors with an original use of materials and light to create unexpected subtle emphatic feeling between the space and the people; handcrafted materials shaped and controlled up to the finest detail interact and interplay with the both the day and night light and reveal an incredibly expressive power. Kokaistudios' newest projects with Four Seasons Hotels & Resorts - the Sintoho Asian fine dining restaurant located on the top floor of the newly built Four Seasons Kuwait in the Burj Alshaya building. Having previously worked together on the Brasserie at the Four Seasons Kyoto the Four Seasons team invited Kokaistudios to conceive an innovative F&B destination that could elevate the street foods of the cities of Singapore, Tokyo and Hong Kong into a fine dining destination and experience. Intrigued by the concept and the location in a city with no established tradition of Asian fine dining we set about creating a temple to Asian cuisine and craftsmanship that eschewed kitschy and thematic styles and aimed for the creation of an essential and refreshing space in which the dining experience is influenced both by the architecture of the space and the food offering. The restaurant design was conceived first and foremost around the idea of celebrating the diversity and excellence of Asian cuisine and creating spaces and opportunities for the guests to experience the sights, smells and tastes of these food cultures up close. We searched for commonalities between the cultures in order to come up with a design language to unite them and we took our inspiration less from the current nature of the individual countries but rather from the historical role that Chinese culture has played over time throughout Asia and how those influences continue to be part of everyday life. The entrance area of the restaurant features a long corridor flanked on one side by an expansive green wall filled primarily with local desert plant varietals and on the other by a series of custom designed water towers which combine to create a cooling and soothing experience. The corridor finishes in a tea wall fronted by an elaborate carved wood tea station where guests can select an expansive choice of fine teas. To the right of the entrance corridor sits the main open dining area on the right that features expansive 12 meter high ceilings that offers expansive views of the city and the Persian Gulf beyond. The front dining area center features a series of custom designed furniture for which we cooperated with Kyoto based artisans and the area is hemmed by an extensive shousugi ban burnt wood sushi counter inlaid with hand hammered brass. The soft lighting in the area comes from the series of water drop glass pendants produced by the London based artisans DHLiberty Lux. The rest of the public area seating is centered largely around the individual open live cooking stations where guests can experience up-close the preparation of robatta, teppanyaki, and dim sum and other delicacies from Hong Kong which have been clad by hand-hammered metal hoods and sculpted stone bases featuring images and motifs typical inspired by classical designs found in China. The strong inter-play between the main materials of wood, stone, and hand-finished metals is thrown a curve by the insertion of a 3D feature wall made of exposed concrete forms that runs the length of the kitchen wall and has been designed using parametric principles and its undulating form appears as a dynamic wave while being in actuality a straight structure. The private dining rooms are an ode to Chinese embroidery craftsmanship with bespoke chairs and walls featuring hand-printed linen fabric albeit with a wink to principal designer Filippo Gabbiani’s home town of Venice via the use of the Fortuny silk pendant lamps and red Murano glass inlays. The bathrooms are an experience in and of themselves as we cooperated with a Shanghai based video production team Flatmind to create a series of Chinese shadow video installations that are projected on the grey hand hammered Chinese stone. The outdoor seating areas that are shared with the neighboring Italian restaurant Dai Forni; also designed by Kokaistudios; feature a stunning glass sculpture from London based artisans Duffy. 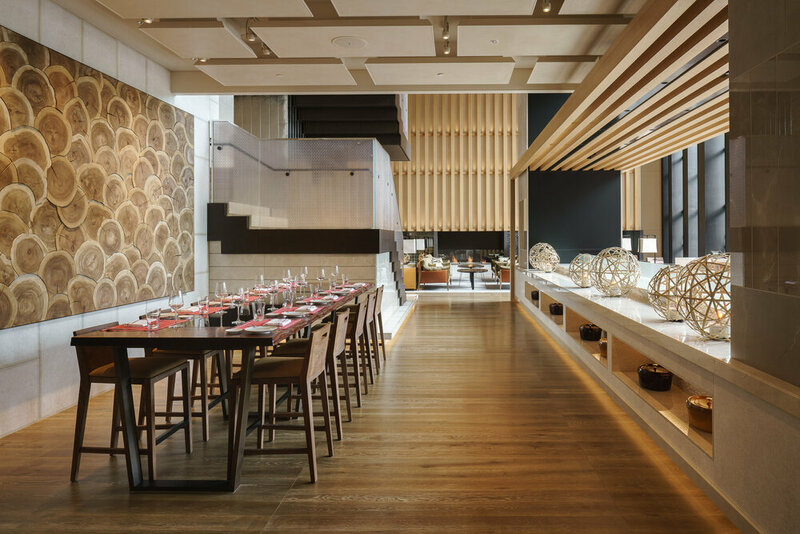 Brasserie Restaurant & Lounge in Four Seasons Hotel Kyoto, designed by Kokaistudios. The Four Seasons hotel is located in the UNESCO protected area of the temples of Kyoto at the base of the mountains and faces a historical traditional Japanese pond surrounded by a magnificent heritage ikeniwa. Positioned between the arrival lobby and the garden, the restaurant is the core of the public space of the hotel. The architect conceived the space on with a strong architectural strategy by using the Kyoto traditional system to connect indoor to outdoor, creating a large architectural feature that frames the view of the garden. The new Four Seasons hotel is located in the UNESCO protected area of the temples of Kyoto at the base of the mountains and faces a historical traditional Japanese pond surrounded by a magnificent heritage ikeniwa. Positioned between the arrival lobby and the garden, the restaurant is the core of the public space of the hotel. The architect conceived the space on with a strong architectural strategy by using the Kyoto traditional system to connect indoor to outdoor, creating a large architectural feature that frames the view of the garden. 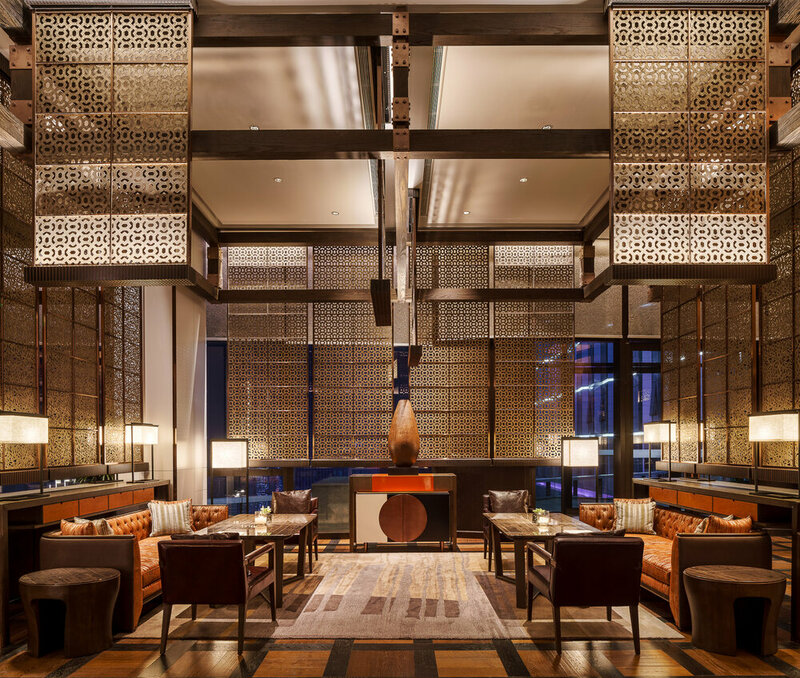 Grand Hyatt Xi’an takes reference from the spirit of the Silk Road and reinterpret into the elegant contemporary interiors of the hotel. Dramatic double-height reception lobby which is enveloped by a feather-like sculptural white feature wall with curving vertical lines that extends 10 meters high, and patterned timber walls forming wing-like motifs. The Chinese restaurant takes guests to an Oasis with stylized trees placed around the restaurant and ruby-like pomegranate screen used as dividers in the ala carte area to create intimacy for dine-in guests. Mockup room in The Sukhothai Shanghai, a contemporary lifestyle hotel located in the heart of the city’s business and entertainment districts. With stylish yet timeless guest rooms, delectable culinary offerings, and exquisite wellness and event spaces, this inviting venue will inspire savvy urbanites with thoughtfully-crafted experiences. Highline is an all day dining, lounge and bar located in the Ascott Serviced Apartments in central Shanghai. The design is a refined and minimal creation, drawing inspiration from US mid-century modernism though an LA luxe filter. The program and site were challenging: the dark, low ceilinged space was to function as an all-day venue for both hotel guests and visitors. Fortunately, an expansive terrace adjoins the space and we were able to extend the dining room onto this terrace, creating a sunlit skyroom which forms a transition between the intimate dining room and the spectacular views from the terrace. The dining room in The Peninsula Suite in Shanghai. Gainsborough silverware, Noritake china and Frette linen adorn the majestic burr-walnut dining table seating up to 12 guests. With two spacious bedrooms, an opulent two-storey grand dining room, elegant study, private residential gym and a living room complete with working fireplace and balcony, the Peninsula Suite offers a truly unparalleled experience. The bedroom in The Peninsula Suite in Shanghai. The finest Frette Italian linens offer the utmost comfort for a luxurious night's sleep. The art-deco inspired light fixture features elements of the Chinese heritage and recreates the look and feel of Shanghai feted as "the Paris of the East". The bedroom in The Peninsula Suite in Shanghai. Enjoy the comfort and style of the chair and ottoman reflecting influnces of the art deco movement with a modern interpretation. Located at the picturesque gateway to the country’s majestic Qing Cheng mountains, Six Senses Qing Cheng Mountain has been created to complement the UNESCO World Heritage & Natural Cultural site at nearby Dujiangyan. It was in this region known as the homeland of the Giant Pandas that the legendary Silk Road began. The resort, which is situated to the west of the Sichuan Basin, is just over an hour’s drive from the regional capital of Chengdu and 48 miles (78 kilometers) from Chengdu Shuangliu International Airport (CTU). The 113 guest accommodations featured at Six Senses Qing Cheng Mountain range from semi-detached suites in duplex villas with balconies and verandas, to courtyard suites, garden and pool villas. Two-and four-bedroom villas offer intimate seclusion, with indoor courtyard, whirlpool or pool, natural wood interiors, unrivalled amenities and exotic outdoor settings. Complimentary WiFi is offered plus a smartphone app that can control air conditioning, television programming and lighting will soon be available to all guests. Global dining and the refinement of Chinese cuisine are showcased throughout Six Senses Qing Cheng Mountain, where emphasis is all about eating well. Farm2Fork is an informal all-day dining restaurant with a fresh-from-the-garden and fun approach, serving mouthwatering Western and regional dishes as well as creative semi-buffets. For signature Chinese dining, 28Zodiac serves time-honored Sichuan specialties complemented with a selection of Cantonese, Jiangsu and Shandong favorites. Sala Thai celebrates the exquisite cuisine of Thailand under the direction of a resident Thai chef, Sarunya Jampadee. When it’s time to simply kick back and relax, the Moon Bar is an animated and quirky lounge with creative cocktails, wines and spirits. Situated within the Moon Bar, the Chinese Tea Lounge serves some of China’s finest teas. The nearby Wok Mee Shack is where guest can savor small bites of all kinds of traditional Sichuan snacks. Farm2Straw Smoothie Bar brings guests a distinctive palate experience by creating smoothies mixed with seasonal fruit and herbs, and C+T Shack showcases a tea gallery and coffee selections, all with an alfresco setting. A Meeting Cluster provides private and peaceful venues for small meetings and events. Opened in late 2017, Le Meridien Shenyang is an ode to both the mid-century modern roots of Le Meridien brand and to the city of Shenyang itself; both in terms of its historical significance as the one-time capital of China’s last dynasty, the Qing, and also its location in the North-East of China with its four distinct seasons. Searching to create a timeless design in which art and graphics would play a principal role, Kokaistudios began the design process with the creation of a sophisticated materials palette inspired by the traditional colors and textures of the region’s forests and by undertaking a detailed topographical study of the current and historical maps of the city together with Beijing-based artists Instant Hutong. The outcome of these initial considerations is a project in which texture, materiality, graphics and art combine to create an immersive and elegant design experience where guests throughout their stay can discover additional layers of the history and culture of the city and the Le Meridien brand by way of subtle design instruments. From the first steps into the hotel, guests are welcomed by a small reception lobby decorated with a 3-D corona engraved bi-color map of the historical and modern city, designed to give the guests a deeper geographical understanding of the space. Off the main lobby sits the Latitude 42 area; with its distinctly modern European design language this lounge area was designed as an elegant gathering point for both hotel guests and the surrounding community. The walls of the swimming pool have been finished with a vibrant green jade marble that acts as an art-piece and counter point to the muted grey stone flooring reminiscent in both texture and patterns of the nearby imperial palace; one of the best preserved in China. This use of materials as decorations continues in the guest-rooms where Kokaistudios have made extensive use of Oak wood which dominates the forests surrounding the city; its gentle tactile nature and simple elegance combine with a scented oil treatment give the rooms a feeling of serenity and coziness. The design of this project is a new step in Kokaistudios method of combining a strong architectural approach to the design of interiors with an original use of materials and light to create unexpected subtle emphatic feeling between the space and the people. Located in the famed Mission Hills area, Hard Rock Hotel Shenzhen is the first of its kind to arrive in Mainland China. The hotel combined modern Chinese architecture with its signature world-class service to deliver a lavish experience.